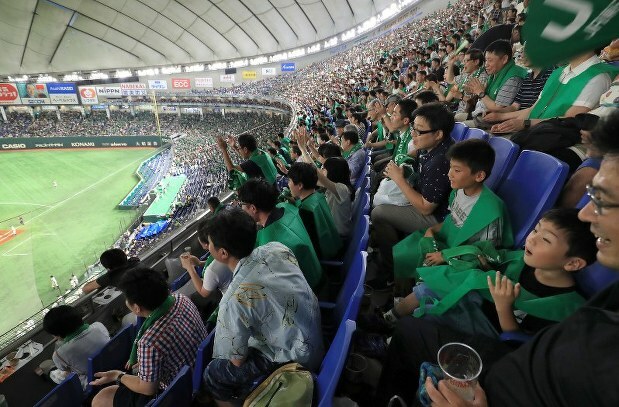 Tokyo Dome is crowded with spectators during the 89th Intercity Baseball Tournament on July 15, 2018. A total of 72,500 people turned up to see teams play on the day, the middle of a three-day weekend. In the third game of the day, East Japan Railway Co., representing Tokyo, battled it out against Seino Transportation Co., representing the Gifu Prefecture city of Ogaki. Both teams have won the tournament in the past, and a tournament high of 34,000 people enjoyed the exciting match, cheering at every good play.